Hot Chocolate is a MUST in the winter. There are few things better than snuggling up in a warm cozy blanket sipping on some hot chocolate. These brownies take it to a whole new level! 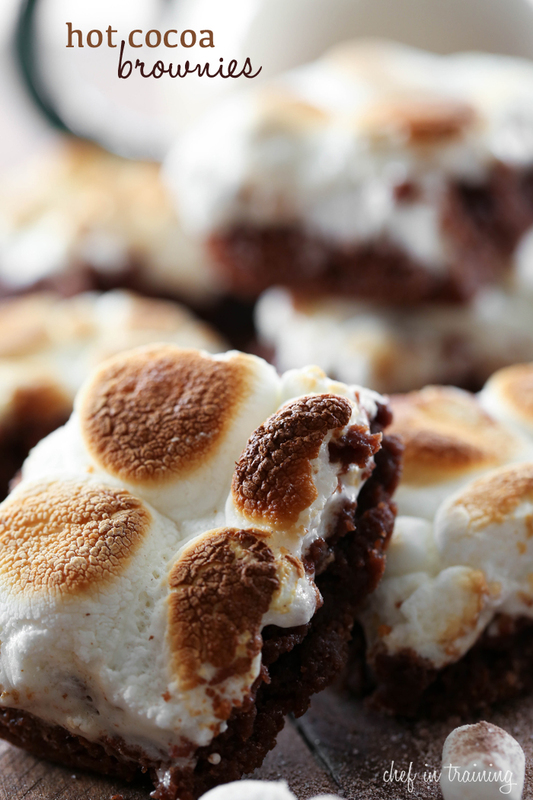 The hot cocoa powder is used in the brownie mix and the toasted gooey marshmallows are the perfect finishing touch! If you are searching for a delicious winter treat, then give these a try! They are delicious! Add salt, cocoa, hot cocoa mix and flour and mix until well incorporated. Do not over mix. Pour into greased 9x13 inch baking pan and bake at 350 degrees F for 22-25 minutes or until brownies are done and toothpick test comes out clean. While baking, cut large marshmallows in half. Once brownies have cooked, place halved marshmallows uncut side up, over tops of brownies. Place under broiler for a few seconds until marshmallows are golden and nicely toasted- WATCH CLOSELY so as not to burn them and so they don't catch on fire. hot cocoa is easily one of my favorite things about winter - loving these brownies!! Well my daughters tried making these brownies to your exact recipe; however the brownies were not done by no means and the marshmallows were on fire in less than a minute. Maybe it would be best to add 32 minutes for the brownies and the marshmallows be added during the last 15 minutes of baking for safer and more accurate results. So sorry for your troubles! I made note to continue cooking until brownies are done and toothpick test comes out clean. I also changed it to just a few seconds and capitalized "watch closely" so that others don't have your same problem. Again so sorry for your troubles with the recipe and Thanks for helping in clarification!